If you're looking for the top things to do in Bora Bora, you've found the right website! 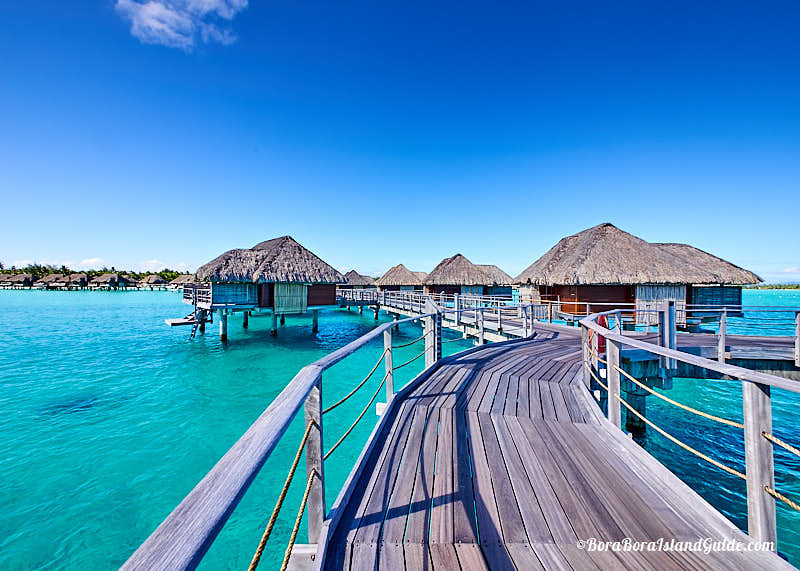 The over water bungalow was designed in French Polynesia, so it's no wonder that these huts over blue water are a symbol of Bora Bora. In fact, 2017 marks 50 years of the over water bungalow in French Polynesia! Bora Bora has over water bungalow options at every level of accommodation, and price; so there's no reason for anyone planning a visit to miss out on this essential Bora Bora experience. If needs be, have it for part of your Bora Bora vacation. Bora Bora's best coral gardens are teeming with more fish than I've seen in any aquarium! Most coral gardens are located in Bora Bora's turquoise lagoon which means taking a Bora Bora lagoon excursion to see them. There is one exception: guests at Sofitel Private Island can access the most popular coral gardens for free. 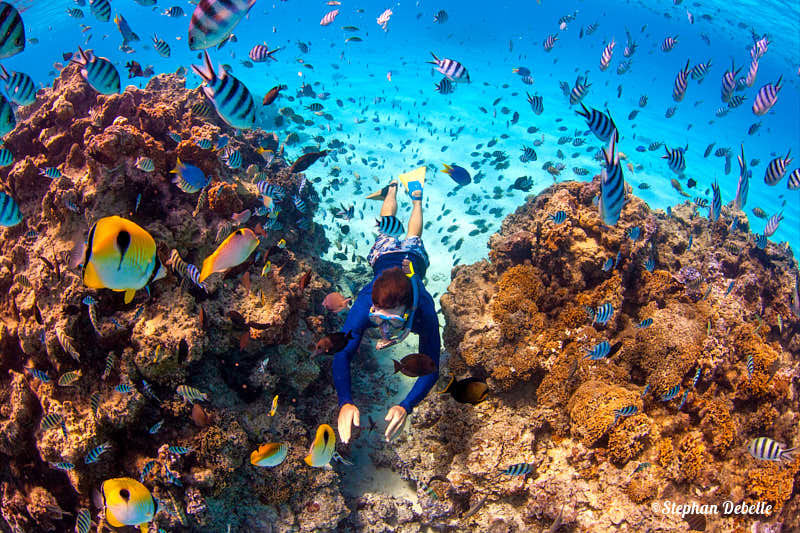 How many, and which stops you have on a Bora Bora snorkeling tour depends on the time of year, movement of sea life, health of the coral and the tour provider you are with. Check availability and book your Bora Bora snorkeling tour here. Tommy's favorite Bora Bora activity! 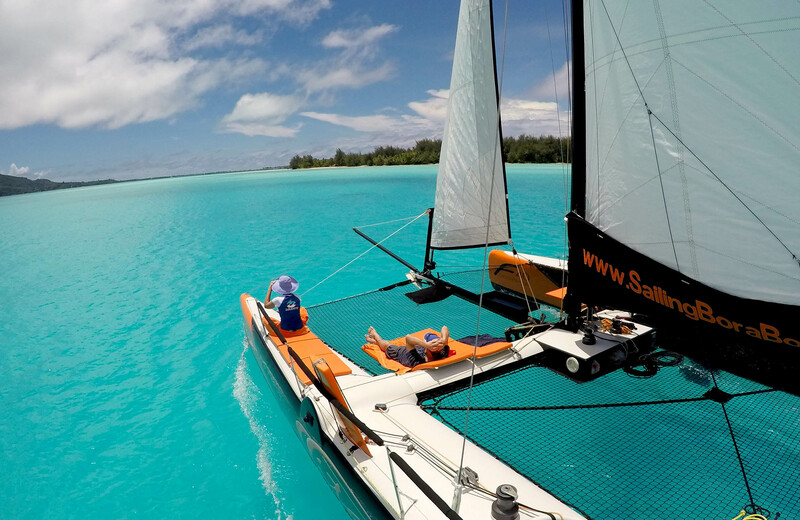 We had such a memorable day, sailing Bora Bora's lagoon, that we've added it to our list of top things to do in Bora Bora. See why a sailing excursion with floating bar experience was the favorite activity of my fiancé Tom. Mum enjoying someone else preparing the food for a change! Motus are little coral islands in Bora Bora's lagoon. They are the quintessential vision of paradise with palm trees, white sand and turquoise water; and offer dramatic views over the lagoon to the towering peak of Mt Otemanu. Lunch on a motu will give you a taste of Polynesian life as your host will prepare fresh, traditional Tahitian food. Some of the delicacies that can be enjoyed are: freshly caught, barbecued Mahi Mahi; tuna served Tahitian style with lime and coconut milk; marinated chicken and tropical fruit. Good food - served in paradise, with Polynesian hospitality - makes this is one of the top things to do in Bora Bora! 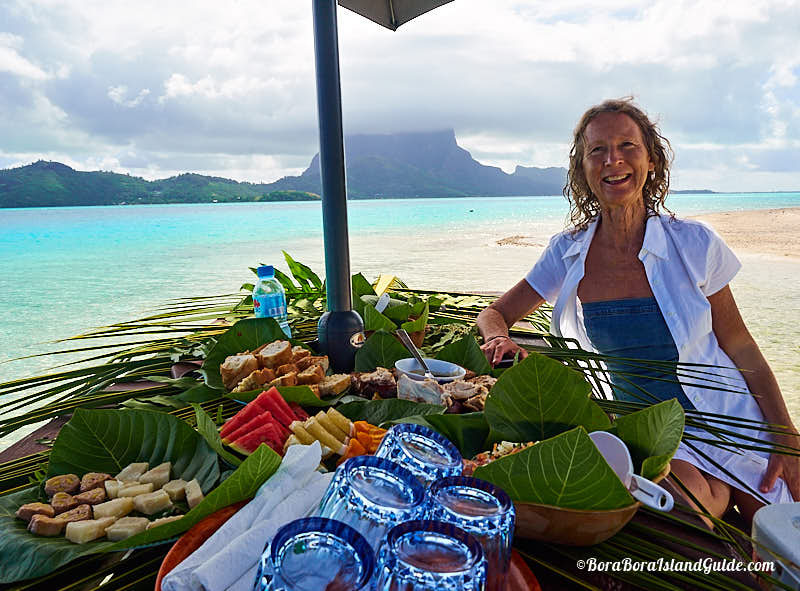 To experience lunch on a motu you will need to book a Bora Bora lagoon excursion that includes a motu picnic. Yes, that's right! Swimming with the sharks is one of the top things to do in Bora Bora! The Bora Bora lagoon is home to graceful black-tipped reef sharks that are timid, but curious. 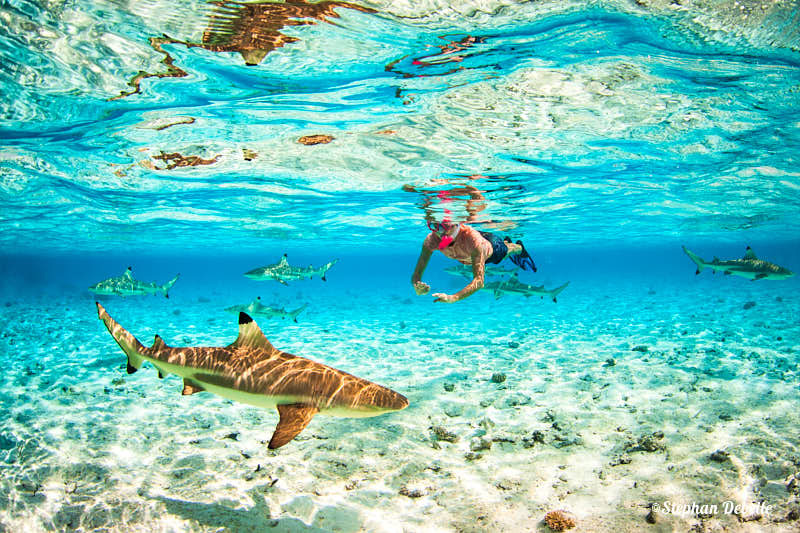 Swimming with the sharks in Bora Bora is a moment that you will remember for the rest of your life, so be brave and book a shark and ray tour snorkeling tour. Make friends with the puppy dogs of the sea in Bora Bora! 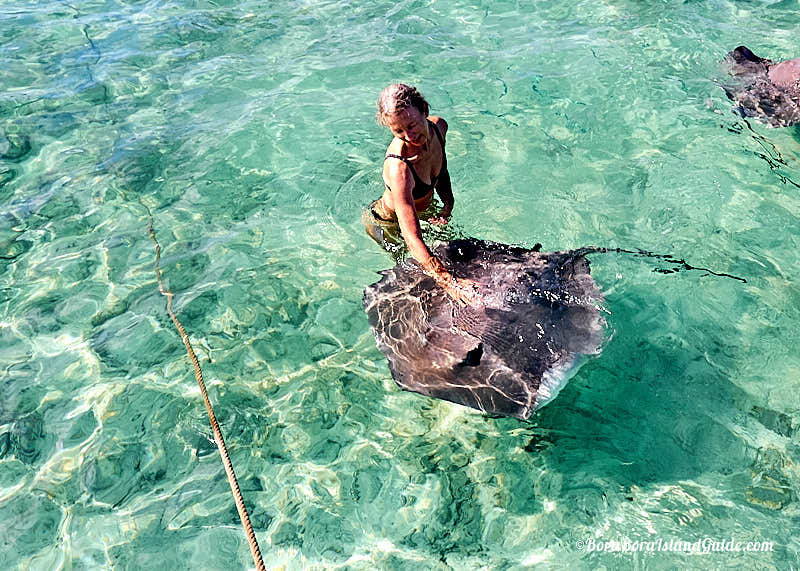 All good lagoon excursions include a stop to feed the stingrays, and you will find out how happy they are to meet you (or happy to be fed)! You can meet the sharks and stingrays on a lagoon snorkeling tour. The inner island is as beautiful as the lagoon! Bora Bora isn't just a beautiful lagoon. There's a vast inner island with history and legend that can only be explored through taking a 4WD tour. 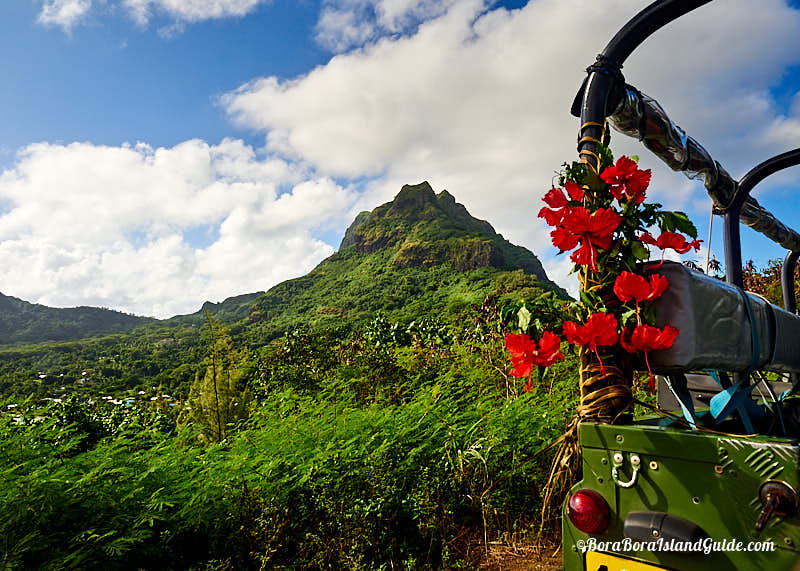 We'd been to Bora Bora many times before finally experiencing a 4WD tour, and we enjoyed it so much that we wondered why we hadn't taken this fun ride sooner. Don't make our mistake: check availability and reserve your place here. There are few places in the world with the beauty of Bora Bora. Going as a couple means that there is always someone behind the camera. For an occasion as special as this, book a photo shoot with a professional photographer for a couple of hours. You'll have an extraordinary record of making memories together. 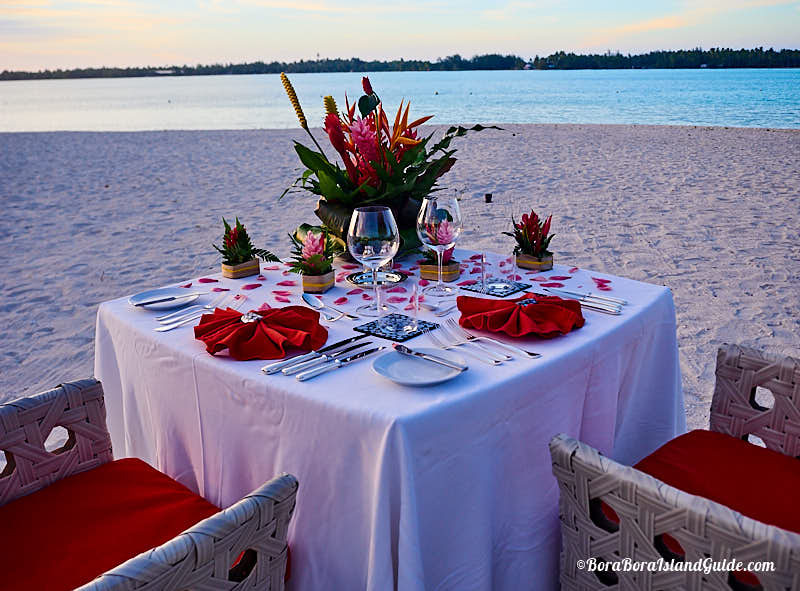 Nothing is more romantic than a dinner (or lunch) for two on the beach in Bora Bora. On a previous vacation to Bora Bora I'd experienced the lunch of my life on the Sofitel Private Island. It was so sensational that I dreamed of returning, with the love of my life, to share this experience. In June I headed back to Bora Bora with my boyfriend and so took the opportunity to book a dinner for two on a secluded beach at St Regis. The evening was magical - so magical that my boyfriend surprised me by asking me to marry him! If you are traveling as a couple, this is definitely one of the top things to do in Bora Bora. 10. Get married or renew your vows! While our proposal didn't turn into an elopement- it could have! 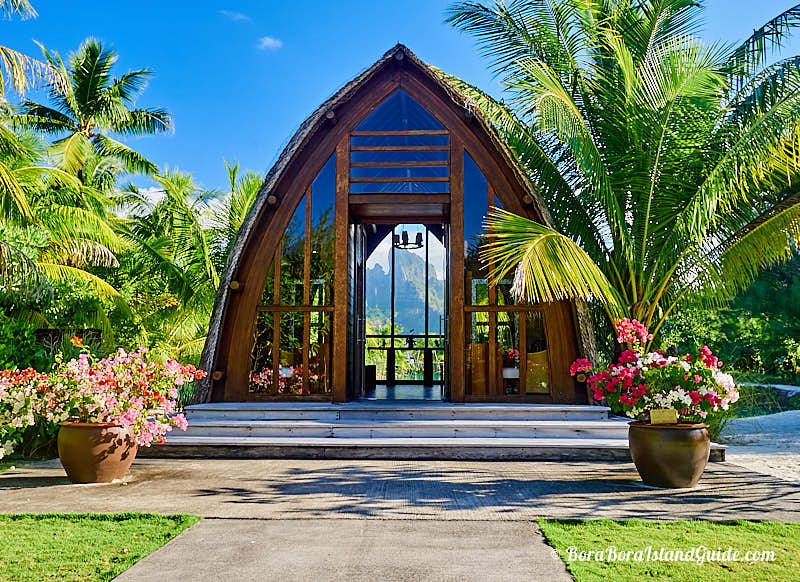 Bora Bora resorts have beautiful chapels for getting married in Bora Bora. There's also the option of getting married on a beach or motu. Ceremonies can be Polynesian or Western style, depending on your preference. Bora Bora weddings are often elopements, or have a small wedding party as witnesses. We think there is no place more beautiful to get married than Bora Bora. Ceremonies can be symbolic or legal, so if you want your wedding in Bora Bora to be legal you will need to organize paperwork months ahead of time. Want more top things to do in Bora Bora? Check out our list of the 10 best things to do in Bora Bora.